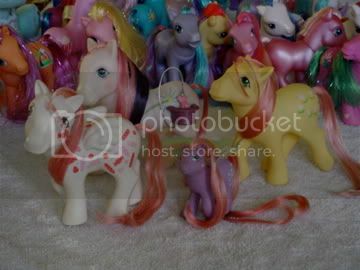 I know this is an old thread, but I have a few ponies I need to re pink and I don't want to mess them up. Two of them have white bodies (Bunny Hop and TAF Yum Yum) and are mint except faded hair. The beginning of the thread talks about dying hair with RIT crystal and specifically mentions that it isn't the same as the powdered RIT. I've googled RIT crystal and haven't been able to find anything besides liquid and powder. Maybe the crystals were something they made in 2007 when this thread was started. Has anyone had good results (no body staining) with using a diluted mixture of the powdered RIT for re pinking ponies with light or white bodies? I'd test it out but I don't have a white baity pony. I, too, only have a pack of powder RIT dye.. I was so happy to get at least THAT. I used the powdered dye, my post is on page three. It didn't stain my ponies, but I have yet to test on a white pony. I did test on Rosedust and a few other lighter colored ponies and it didn't stain them. I've used food colouring before now. Didn't stain the pony (I would know because I tried to dye another pony peach with it!) and it took a few applications to get the right darkness so there was no risk of ruining her. I haven't been able to locate the crystal RIT anymore either, but the powder kind works pretty much identically. You can dip the pony in, even white ones, withoutstaining, but be more careful repinking flocked ponies. I might just have to use BBE Gusty as a guinea pig. Just dip the little zombie's toe in the pink pool and see what happens. The verdict is in on RIT powder dye vs. white ponies! Petal Pink RIT dye in powder form is no match for the power of the white pony! At least not for the time it takes to dye faded hair. Here are my girls after their dye jobs. The G3 girls are standing around ooohing and ahhhing over how gorgeous they all look. I bought a box of Rose Petal RIT powder from ebay and had no problems either. Re-pinking is really fun and addictive! 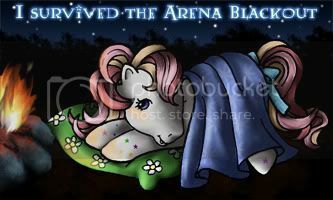 ^^ I was quite sad when I ran out of faded pink haired ponies! Awesome result Asuka!!! your ponies look gorgeous! Oh, I have several ponies who need repinking and knew I'd seen a thread about it recently. I will be trying the RIT powder method as soon as I am able to pick some up (hope my Walmart has it!). I can't wait to try it! Thanks for all the great advice in this thread! Ok, I got my powdered Petal Pink RIT dye today and repinked some ponies! A couple may need to be dunked again as they didn't turn out quite as pink as I wanted, but they are all greatly improved I think! for me that makes the absolute perfect shade of pink. I usually use the Rose Pink rit dye powder/crystal form, that's the only pink I've ever seen, but like I said, it's a touch too reddish.